At the beginning of this #a month of A to Z challenge, I already knew what S was. I have a list of blog topics on the blackboard in the kitchen and S has been up on the side all ticked off since the beginning. I did toy for a while with S is for Stash (but manged to work Stash photos into K is for Knitting). I think that I am going to post about taming the stash sometime in the new year though. S is for Shawls or S is for Scarves were also briefly considered and discarded. I love sock knitting. I'm not obsessed or anything. I do knit lots of other things. But I really the love the challenges of socks. Wrangling four needles to knit in the round. I'm old school enough to prefer double pointed needles not circulars. 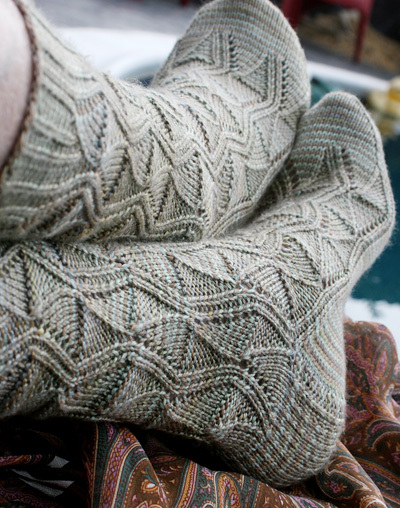 The mental concentration in turning a heel and the mathematical beauty of the process. Their portability and how quickly they grow. I love entertaining and amazing crowds on public transport with a sock in progress. 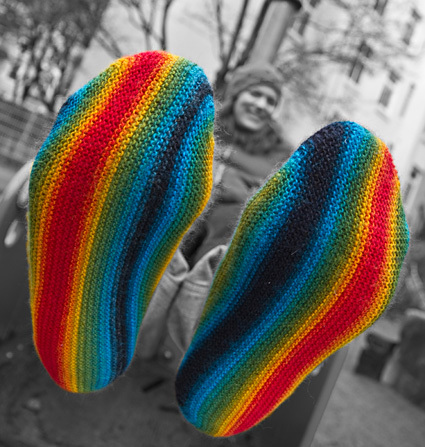 So this post is an indulgence to the beauty inherent in a hand knitted sock as well as virtual aide-de-memoire of awesome socks whose patterns I have been squirreling away for a rainy day. These are all top down socks and all of these are free patterns! Rivercat by Brenda Patipa. Free pattern on Knitty. 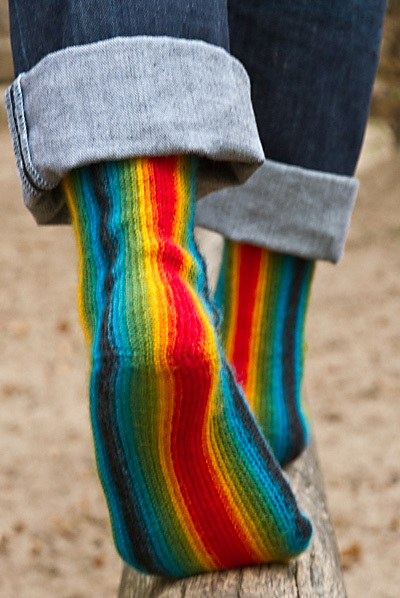 (It's just possible that I think Brenda designs very cool socks). Treetop by Heidi M. Scheppmann. Free pattern in Knitty. This one is a little tricky and you should see how many charts it has! But has to be the best cable sock I have ever seen. 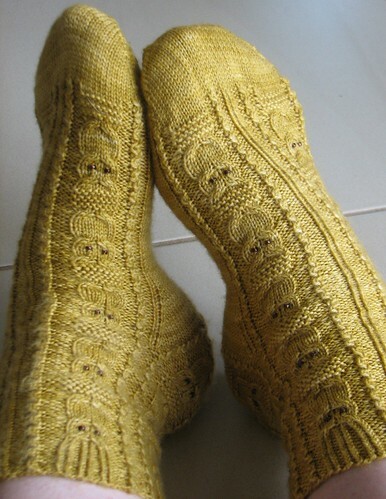 Monkey Socks by Cookie A. Free pattern available from Knitty. Everyone (and possibly their sock monkeys too) seem to have knitted this sock. 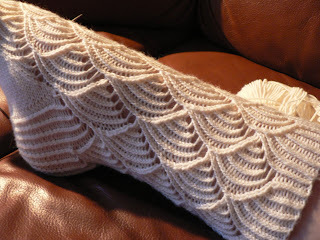 As of December 2012, there were 16,106 projects for this sock on Ravelry! Longitudinal by Nicola Susen. Free pattern from Knitty. 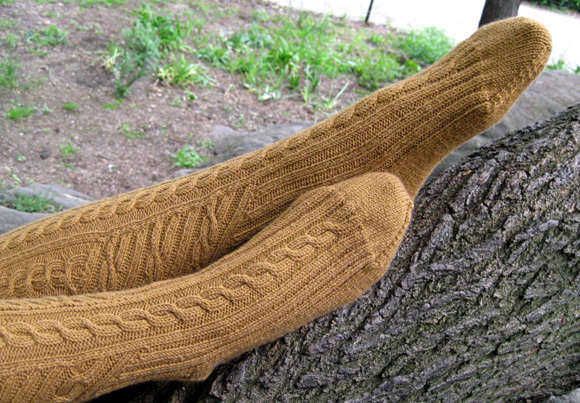 These are knitted sideways. Looks like a really interesting challenge (and I have wool biding its time in the stash just waiting to be knit into these). Owlie socks by Julie Elswick Suchomel. Free pattern download from Ravelry. The little owl eyes are knitted in beads. Cool way to master another new technique. And I think this is just the stash wool for them. This is Wisdom Poems Sock Yarn in the Colour Pumpkin Patch. 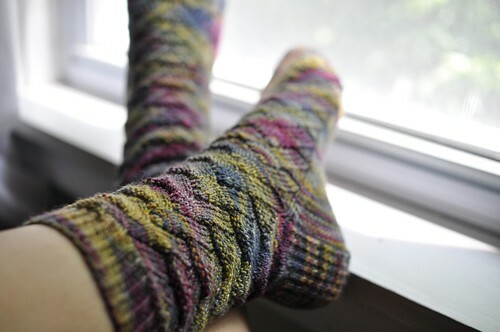 Pomatomas Socks by Cookie A. Free pattern in Knitty. Socks someone wants me to make for them! For my daughter's friend with the shark obsession. Shark Socks by the Tsock Tsarina. Sadly only available to participants in her sock club at the moment. I'm having a serious go at trying to track down a kit! I do have a bloggy friend in the US who has a kit and thinks it's too difficult for her, so I'm trying to cajole her to send them to me to knit. (I even offered to pay for them). The sock in the top picture is my favourite.